The 3 Play Off Finals are the culmination of a full season of action in both the men’s and women’s games, you will witness spectacular basketball for free, just drop in and watch (but be aware there is a maximum of 500 seats, so first come first served). We are hoping to have food and drink outside provided by a local stall, but you can still feast your eyes on the best basketball in the Exeter and District League. 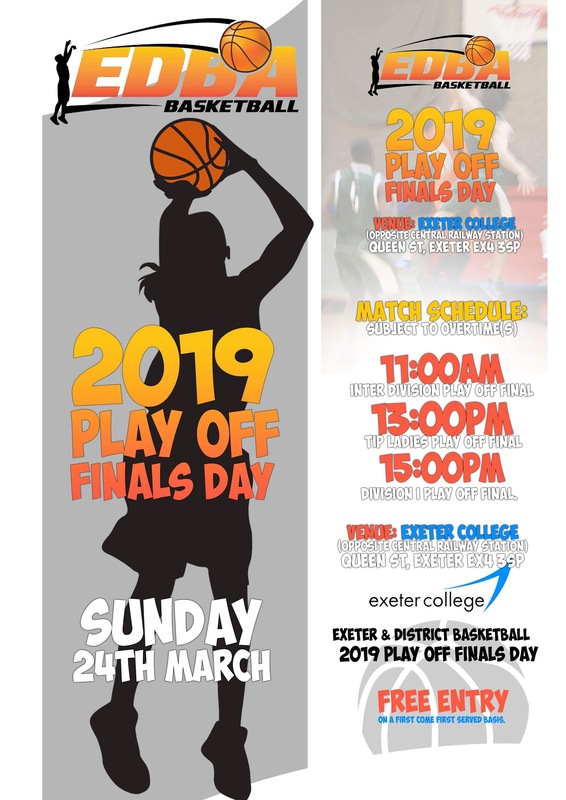 All the matches are taking place at Exeter College (opposite central railway station) Exeter, EX4 3SP on the show court. The games start at 11am with the Inter-Division Play Off Final, followed at 1pm with the Ladies Play Off Final and bringing a close to the 2018/19 season is the Men’s Division I Play Off Final at 3pm – come and make some noise! !